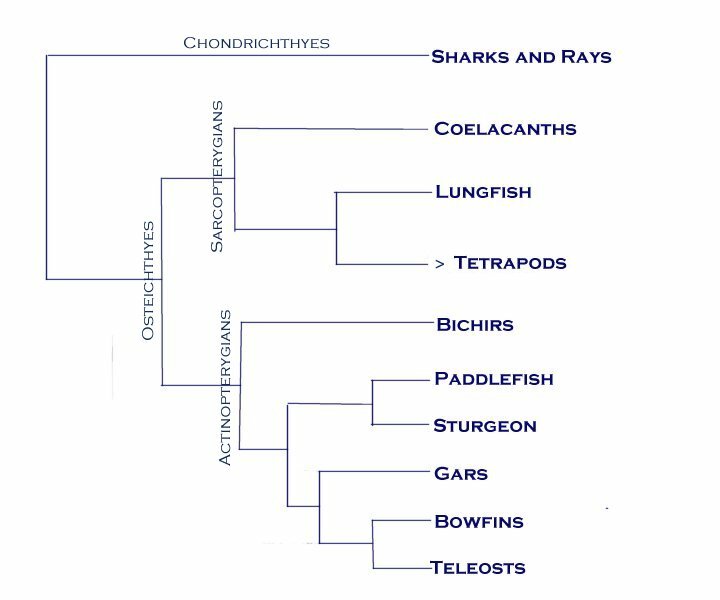 The vertebrates represented below are those with jaws, or the Gnathostomes. Features that distinguish the jawed vertebrates include the vertebral column -- a reiterated series of bones that surround the spinal cord, and a skull that surrounds the brain. These are formed of either bone or cartilage. Other important features are paired pectoral and pelvic fins. In the living sharks and rays (Chondrichthyes), a cartilaginous skeleton helps to lighten the animal's body. In the bony fish (Osteichthyes), the cartilage in most groups is replaced with bone, and buoyancy increased by lungs or a swim bladder. The bony fish are divided into two groups based on the structure of the fin. In the Sarcopterygians, or fleshy-finned fish, the fin has a fleshy base with articulated bones supporting the fin. In the Actinopterygians, or ray-finned fish, the fins are supported by a fan of spiky fin rays. Among the ray-finned fish, the largest and most diversified group is the teleost fish. For groups that could be seen at the James R. Record Aquarium at the Fort Worth Zoo, a link has been provided to representatives of each group. The James R. Record Aquarium was closed in 2002. Representatives of most of these vertebrate groups can be seen in the James R. Record Aquarium. Paddlefish and bowfins are not currently on exhibit. Coelacanths survive poorly in captivity.